BEHIND ANY DIFFICULTY HIDES AN OPPORTUNITY'! speak of truly unique purchase possibilities! 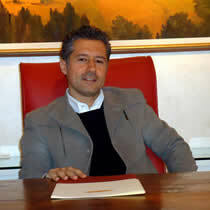 On the first of June 2007 Real Estate Agency DIMORE SENESI opened her doors in Castelnuovo Berardenga (SI) in Via Garibaldi, by initiative of the only owner Riccardo Leoncini. The real estate agency Dimore Senesi interpretates a highly innovative professional relationship by providing a personalized service to each customer and situation. The seller meets in Dimore Senesi a consultant to the sale with whom to agree, based on its commercial sensitivity, exposure modes, Publications or absolutely confidential proposals of their property to the chosen target. The only goal is to close the sale with a few well-selected visits, in the shortest possible time, eliminating all unnecessary exposure and appointments..
For the growing importance of the web in the real estate market and to assure a powerful and effective positioning on planet internet, we are present in almost all the major property portals and in the front row with our corporate well vsited and allways up to date website. High-quality images and accurate descriptions are the basis of all our presentations and the means of communication by which we establish the first contact with potential buyers.